I started with style guides like any other obsessive-compulsive designer: with the desire to make it simple to maintain and grow a design. Plus, knowing which component to use in a given situation is nice, too, right? Since making this a regular practice, I’ve found it’s been like having a nice combination of a CSS class and a pattern library all in one. One of the first questions, understandably, is why use Fireworks for a style guide? Well, for me, it’s mostly because of symbols and styles. Sure, you could use similar things in Photoshop, but I find Fireworks’ implementation to be smarter. Symbols update everywhere, and you have to update them only once. Symbols have states, which let you easily show things such as selected and unselected states. 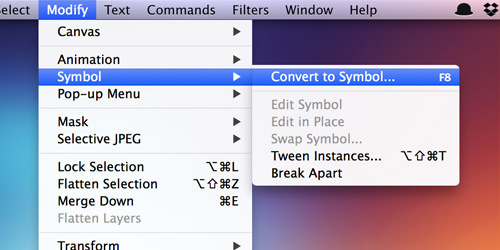 Symbols may be placed on a single page for easy editing. If the styles are for the Web, you can easily export them as CSS. This article is all about understanding why you would want to set up a style guide using Fireworks, and you’ll also get a little starter template that I like to use. Important note: Fireworks’ future is uncertain, as Adobe decided to feature-freeze it in May 2013. There are rumors of Adobe working on a replacement, but nothing definite so far. I’ve spent the last few months with an alternative, Sketch, and found it to be… well, pretty fantastic! It’s a young Mac app but shows promise. Also, while Fireworks (CS6) is unlikely to receive any major updates in future, it is still distributed and supported by Adobe and should work on the latest Windows and Mac machines. You can read more about Fireworks’ future in this pretty detailed article. 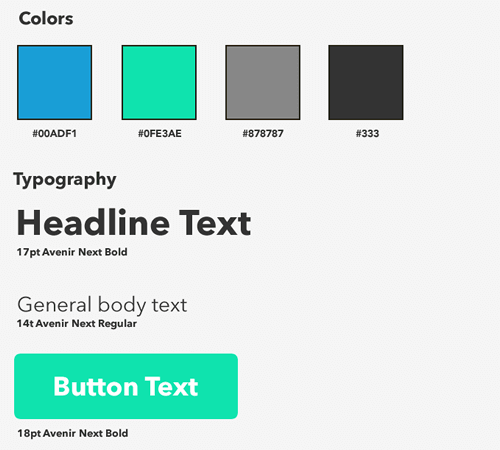 The biggest reason to create a style guide? The sheer amount of time you’ll save. Depending on the size of the project, reproducing your changes could take minutes or hours. Imagine designing a game, a complex website, a mobile app or a large corporate intranet: having to update one element that appears on dozens or hundreds of pages would be a tedious, madness-inducing task. You have better things to do, like look at cute cat pictures — why waste your time doing the same thing over and over again? A style guide helps you to maintain a consistent look over time, and Fireworks can save a lot of time. If you work on a team or for a client, handing off the document to someone else is very easy. You’ve already done the work of specifying how things should look; so, anyone else can step in and pick up where you left off. Speaking of which, if you’ve ever applied a CSS class or ID to an HTML element, then you’ve basically written a style guide — even if you didn’t necessarily formalize it as such. Who Uses Style Guides Anyway? important modules, like headers and carousels. Fireworks is not the most suitable application for defining such things as animations, CSS transforms and transitions, or non-Web-font families (or CSS styles in general, although Fireworks does export CSS code, if needed). These are a critical part of the experience but might be better defined with a prototype or the like. All that being said, the size of the style guide should fit the project. 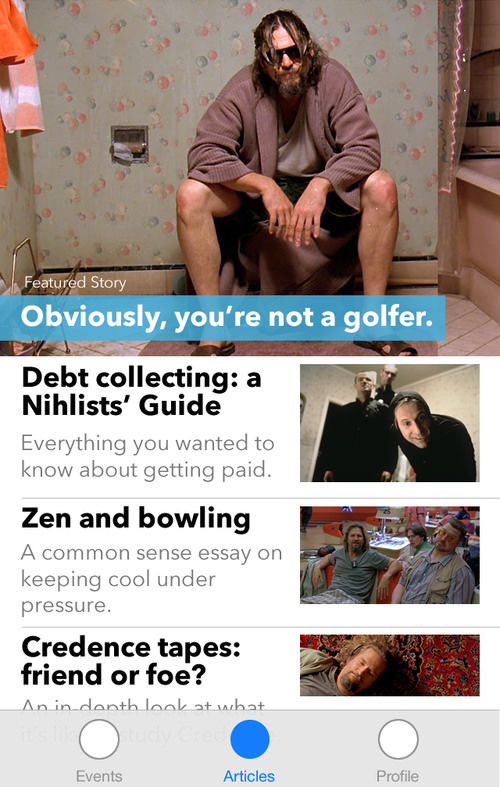 If you’re making a simple app, you could probably keep it lean. If you’re working for a financial institution, then it might need to be substantially bigger and more prescriptive. The format and level of detail are up to you. If you’re developing a mobile app, ensure that the design and development team is familiar with the human interface guidelines of the relevant device or platform. Apple, Google, Microsoft and others publish guidelines to ensure quality and consistency. The guidelines are geared to designers, but you might want to ensure that your team understands things like the minimum touch size for buttons (44 × 44 pixels for iOS, by the way) and the standards for typography and icons. I try to keep everything on one page in Fireworks, because exporting slices is much easier if all elements are on the same page (more on that later). The alternative is going to each page, exporting an image, checking that I’ve put it in the right folder, and then cursing myself if I’ve accidentally saved it to the wrong spot. repeat 50 times (getting sadder each time). Clearly, no one would want to do this. If slices were a person you could hang out with at a bar, I’d buy them drinks all night. 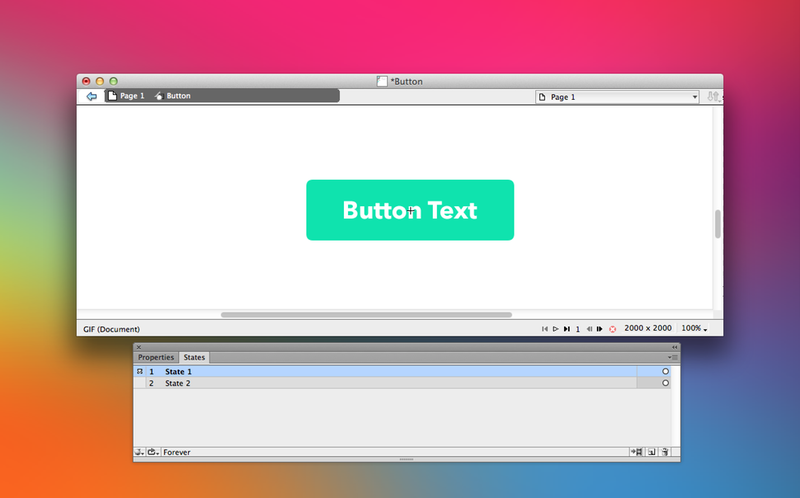 Use a symbol when a UI element repeats throughout the website or application. The usual candidates are buttons, icons, images and logos. A symbol has states, too, giving you the flexibility to display various states of an element (for example selected and unselected) or just to test various iterations of an item. To convert an element to a symbol, simply select it and go to Modify → Symbol → Convert to Symbol… (or press F8). Convert an object to a symbol. I generally reserve styles for text (font family, size, color, drop-shadow live filters, etc.) 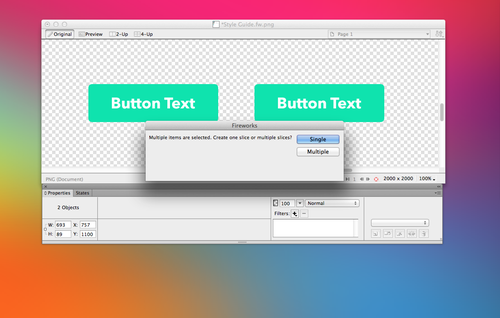 and buttons (color, appearance, etc.). For example, if you add borders or live filters (for example, drop-shadows) to an image or button and want them to be easily reusable, make them styles. Also, symbols may contain elements with styles. Once your symbols are set, create a slice for each element. Fireworks’ naming convention is not human-friendly (it comes from old Web layout practice: [Document Name][Row Number][Column Number]). 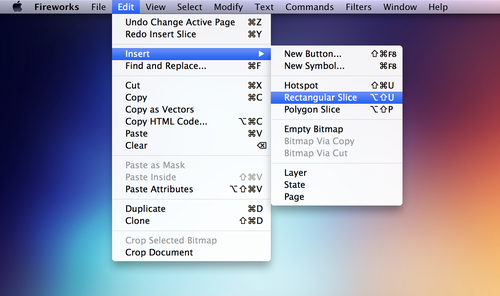 So, look to the all-powerful Properties panel to create your own names for slices. 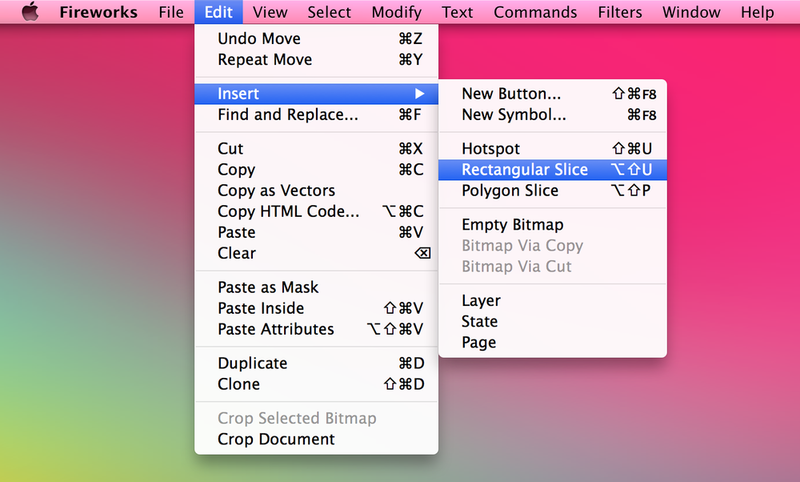 Useful tip: You can highlight multiple elements and create individual slices for each one. Simply select all of the elements on the canvas, and go to Insert Rectangular Slice → Multiple slices! It’s a real time-saver. If you’re creating an app, try to work with vector graphics whenever possible, which make it much easier to scale icons infinitely to higher-resolution devices. I’ll have to gloss over some finer points, such as ensuring that icons scale down well. Useful tip: The Icon Design Handbook has you covered on that front. 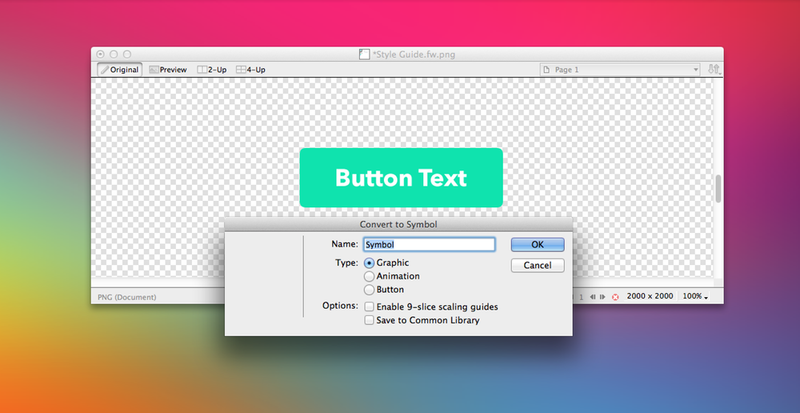 It has has great tips on making beautiful icons. Also, Ivo Mynttinen teaches quite a few things about designing icons with Fireworks. So, how do we achieve this in Fireworks? Sure, we could drop in regular and @2x versions, but vectors can be exported as SVGs, courtesy of Aaron Beall’s handy Export extension. When To Start Preparing the Guide? 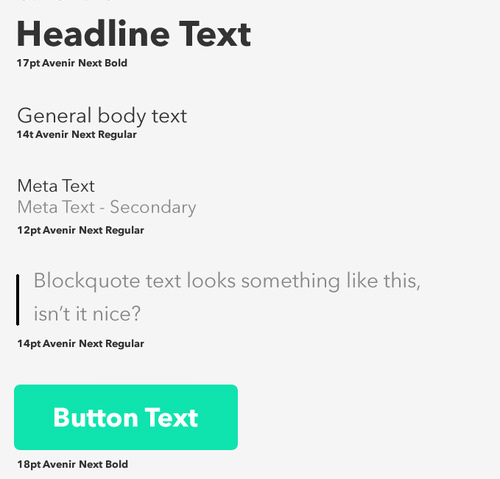 Picking the right time to build a style guide isn’t an exact science. I usually start once I’ve determined a direction for the project. Creating it first usually wouldn’t make sense because I’ll often experiment with fairly different ideas. Doing twice the work doesn’t appeal to me. You also don’t want to end up a slave to the process early on. Creativity should be messy, weird and fun — bottling all that up in a style guide too early on would really break your groove and stifle the design. The style guide should reinforce your creativity and, therefore, should come second. Don’t wait till the end either, because you want it to guide the rest of the process. In short, don’t do it too early, but don’t wait until you’ve finished the design. Having to duplicate objects from page to page is a good sign that you should create an asset (i.e. with symbols) or define a style (i.e. with styles). My style guides usually start out as a working canvas: Design elements and type treatments that I like will hang out on the canvas until I decide they should be standardized (and become part of the style guide) or discarded. Using symbols and styles early on also means that you won’t have to apply endless updates if one icon changes. I’ve overlooked doing this a few times and probably said some words that I regretted as I went back to adjust each little mistake afterwards. Before creating the canvas, keep in mind that it is a living document, so you’ll need to help it grow, pruning here and adding there. The short answer is, whatever works for you. I’ll share what works for me, and you can build on it. Or throw it away. It’s fine, really. Your mileage will vary according to what you’re creating. I’ll open a page at the beginning of the document. Once I’ve gotten a sense of the direction of the design, I’ll put some of its elements on this page and make styles and symbols out of them. OK! We’ve got our interface elements. 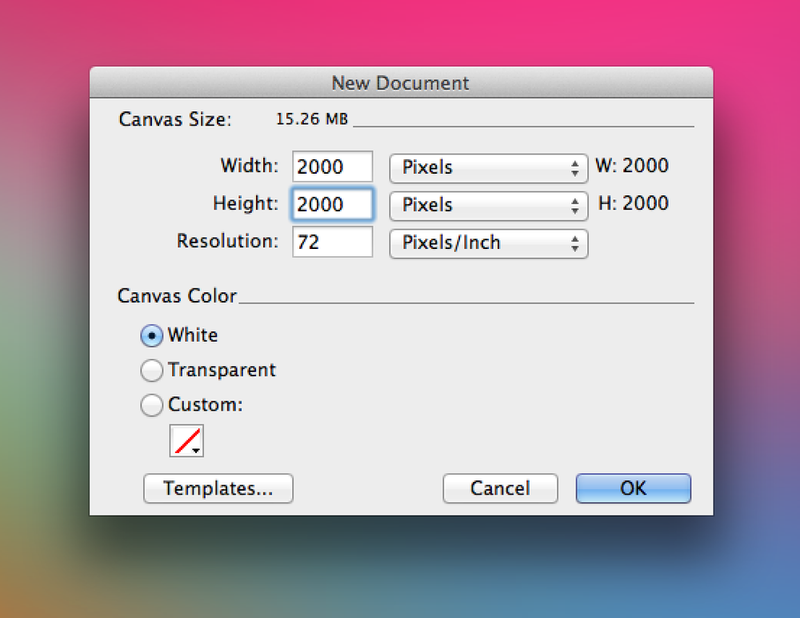 Now, create a document that is 2000 × 2000 pixels. You might not want to give the style guide the shape of an app or website, or else a client or team member might think that they’re viewing an actual app. Once you’ve determined a direction, there’s no reason why you can’t begin to customize this style guide to match the feel of your app. It’s a nice way to ensure that everything you’re designing works holistically. Plus, your client will appreciate the details. I’ll also start to use the guide for some production duties, like saving assets. When designing for iOS, ensure that the normal versions of icons look as crisp as the @2x versions. I’m a big fan of “Snap to Pixel” when working with icons (go to Modify → Snap to Pixel or type Control/Command + K) — it helps with keeping things looking sharp at small sizes. I fully admit that this is a case of designer’s OCD, and I’m OK with that. I’ll create the normal-sized versions later in the process, when I’m ready to send over some assets to the developer. No sense in creating extra work for myself early on. Also, I design at the @2x resolution by default because I find that scaling down for smaller resolutions is easier than scaling up. 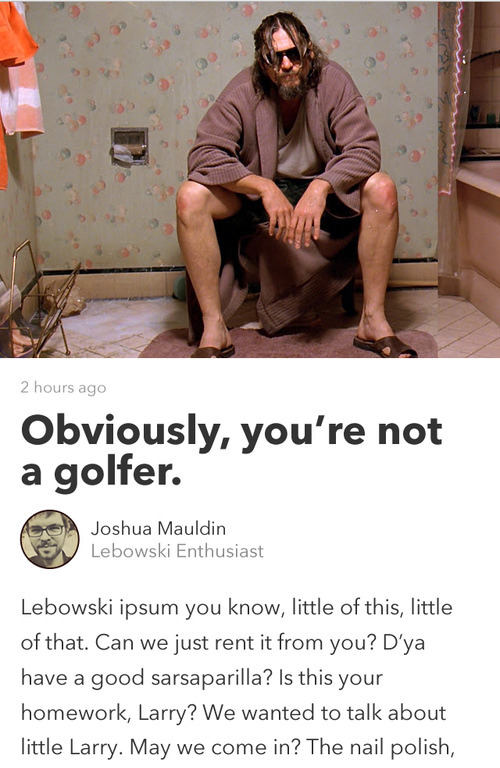 Remember, though, that your font sizes and other elements will be double their normal size when you do this. When working with text, specify in the style guide the intended type size, not what Fireworks says. (When scaling text along with the document’s overall size, Fireworks will change its size, but the Properties panel might not report the actual new size. It seems to be an odd limitation of Fireworks’ text engine). Here’s where it gets more fun. 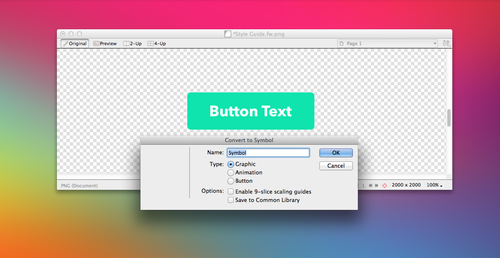 Now that your buttons, logos and other elements are in the style guide, you can easily highlight them and creates slices. 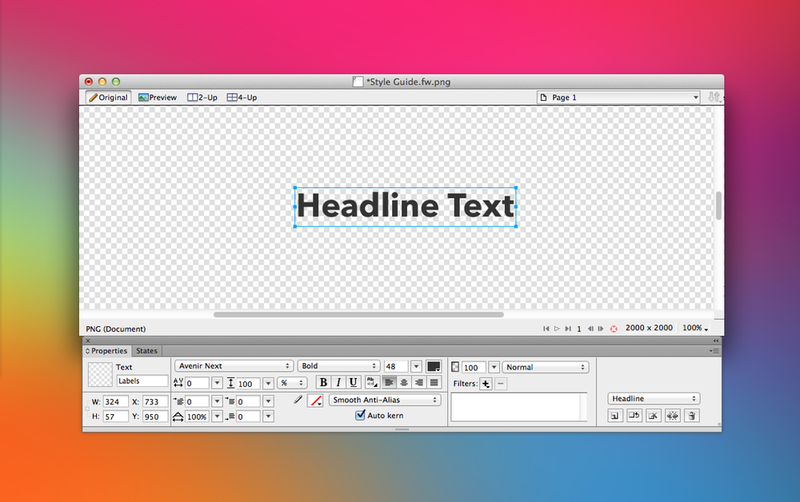 If you’re working on a project that requires higher-resolution assets, then duplicating your symbols on the style guide’s canvas and exporting them directly from that page is simple. Note: When Fireworks asks, choose “Multiple,” or else it will create a single large slice. Slices are ready to be exported whenever you’re ready! You can even give slices their own export settings (PNG32, PNG24, PNG8, GIF or any custom format — for example, PNG8 with a limited number of colors, JPEG Progressive with a set quality, etc.). 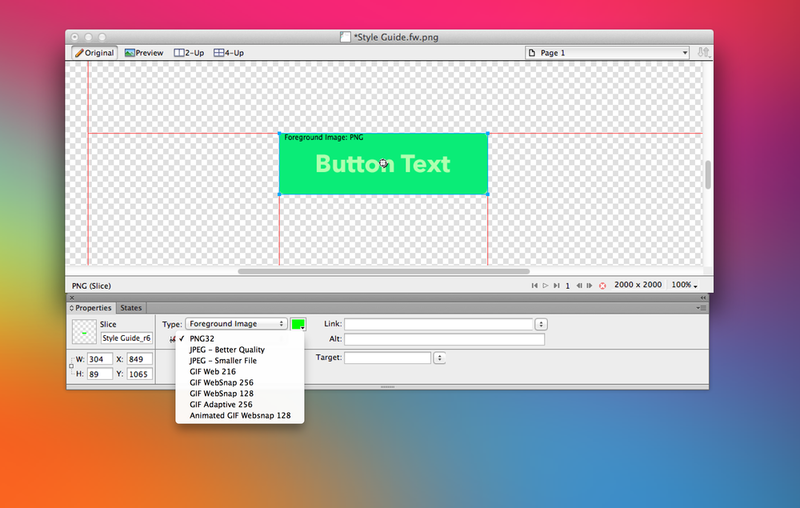 The settings will be saved in the Fireworks PNG file, so exporting and re-exporting assets is very easy. In case you missed it, you can download my starter style guide via Dropbox. The Pages, Layers and States panels help you to navigate quickly through the Fw PNG file. I use states to prototype designs for a particular view or page, and each view or page will have its own page in the document. I’ll generally make a master page (containing the chrome and unchanging elements in the design, such as the menu or tab bar) so that I have one less thing to paste in the page. 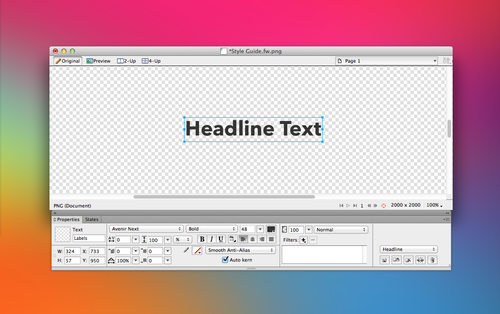 Styles are helpful because you can select an element and immediately apply a style to it. The document library holds all of the symbols, and it’s an easy reference point if you need to drag something onto the canvas. I find myself just copying symbols from an existing page. (Quick aside: Fireworks has some issues with trackpad scrolling in panels, but you Windows geeks should be just fine with scrolling, I hear). Finally, the Properties panel gives you complete control of the properties of all types of objects, including vector objects, bitmaps, symbols, auto shapes, vector masks, slices and more. makes it easier to grow or modify the website or application. 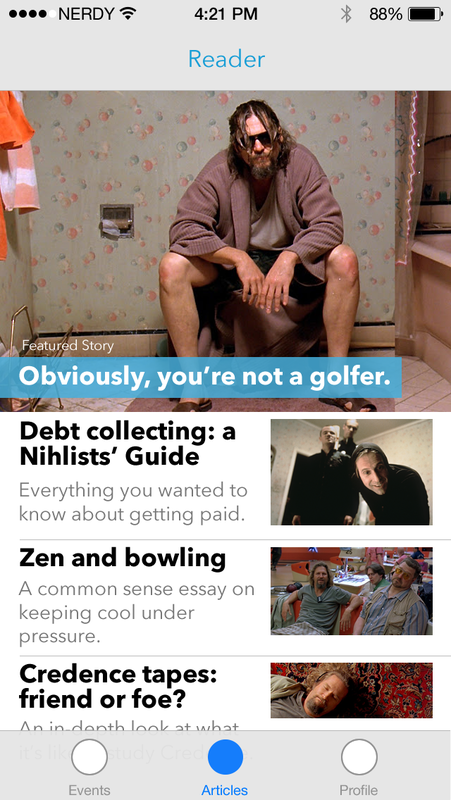 In short, if you’d like a consistent, healthy app, then don’t overlook style guides. A guide converts design styles into values and standards of coding, and it could be invaluable to your project. If you use Adobe Fireworks in your daily design workflow and have any questions about how to build a style guide, let me know on Twitter or here in the comments — I’d be more than happy to help! I’d also be glad to hear of your own experience with making (and updating) style guides.